Although a little bit late to the blog side of things, my review of Aunt Rosie’s for the City Newspaper was my favorite restaurant review I’ve done so far on the paper side of things. I found it challenging to work on a review of a place I knew well already and to balance my previous positive thoughts with tackling the food I was served during my “review” visits. Luckily, what I was served fell right into line with what I knew the food to be there and was able to write a positive review of one of my favorite places in town. I also sat down with Chef Paul Vroman for a podcast a week or two after the review. Take a listen to that episode in the link below and if you enjoy it feel free to grab some of the older interviews I’ve done and catch up! I think for every person that enjoys food, there is a restaurant that fits them in a specific way; an eatery that makes them feel at home with dishes on the menu that seem like they were tailor made. For me, that place is now Aunt Rosie’s, and that chef is Paul Vroman. From the time the restaurant opened last November, Vroman has been working within Aunt Rosie’s nominally Italian menu and using those base dishes as a springboard for his robust flavors. While the menu has had a similar framework throughout the year, a focus on seasonality and local ingredients drive the different versions of dishes to keep things fresh. My visits crossed over between the last dinner menu of the summer and the first of the fall, giving a nice sampling of dishes during the seasonal transition. The salads on the menu are deceptively simple and highlight the best produce at the time. The version on the summer menu ($10) consisted of arugula, heirloom tomatoes, and Mexican Gherkins with First Light bleu cheese and a bright dressing. This was my favorite dish of the summer due to the almost candy sweet cherry tomatoes sourced from Southern Exposure’s rooftop farm and the combination of the bitterness of the greens, fresh cracked pepper, and the half-hard bleu cheese. 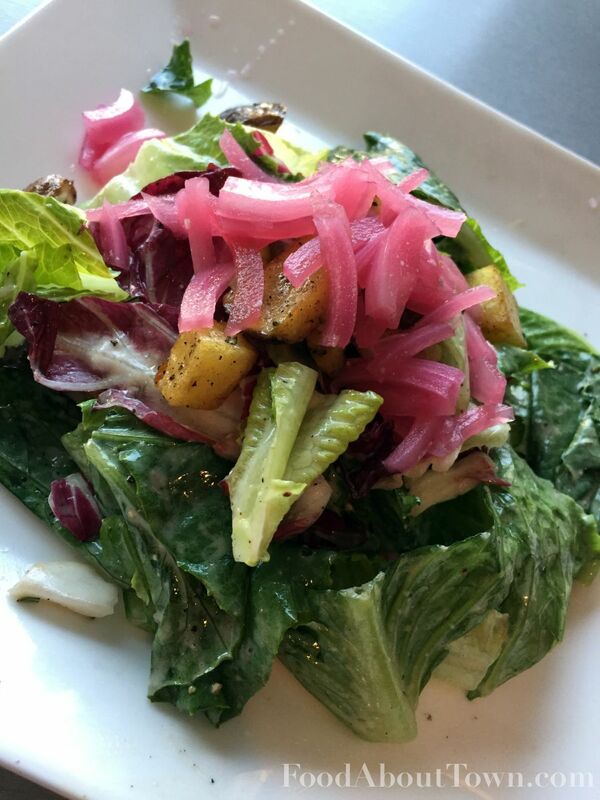 The fall version ($10) played with the flavors of a Caesar salad with an anchovy dressing on romaine, crispy potato chunks in lieu of croutons, and pickled onions to give more crunch and acid. The fried, hash brown-sized potatoes were little bombs of herbed creaminess that served as an inspired substitution that worked well with the sharper flavors of the rest of the salad. Risotto ($11 appetizer/$19 entree) was found in two varieties as well, the summer version with baby zucchini and bottarga (a salt cured fish roe), followed by a pumpkin and chicken liver mousse iteration on the current fall menu. When I bit into the pumpkin and liver mousse, the base flavors melded together to a richness that immediately felt of fall. A sharp gremolata of parsley, lemon zest and hazelnuts brightened things up and added a pleasant contrast. Keeping with the Italian theme, a rotating selection of perfectly fried and crunchy arancini ($7) and pizzas ($10-$13) are menu staples as well. The pizza at Aunt Rosie’s starts with a base flavor that tastes of mildly seasoned focaccia and is cooked in a gas oven that leaves the outer crust airy with a solid crunch throughout. Not my favorite crust but one that serves the toppings well. 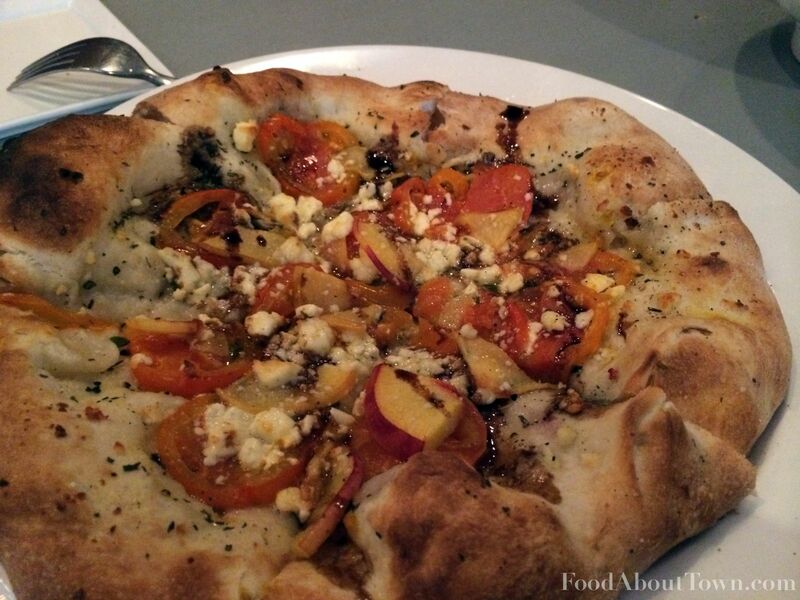 Although there are more traditional options like the Margherita and Three Cheese, the combinations I was driven to try were more inventive, like the peach, tomato and feta cheese special my partner and I had from the summer menu. This was another instance where truly knowing your ingredients was the key to success. The meaty, almost savory slices of heirloom tomato balanced out the ripe peaches while the mild feta brought some salt, (although a touch more was warranted). My two favorite items on the menu were the gnocchi ($13 currently) and the bucatini/spaghetti dish ($11 appetizer/$19 entree). 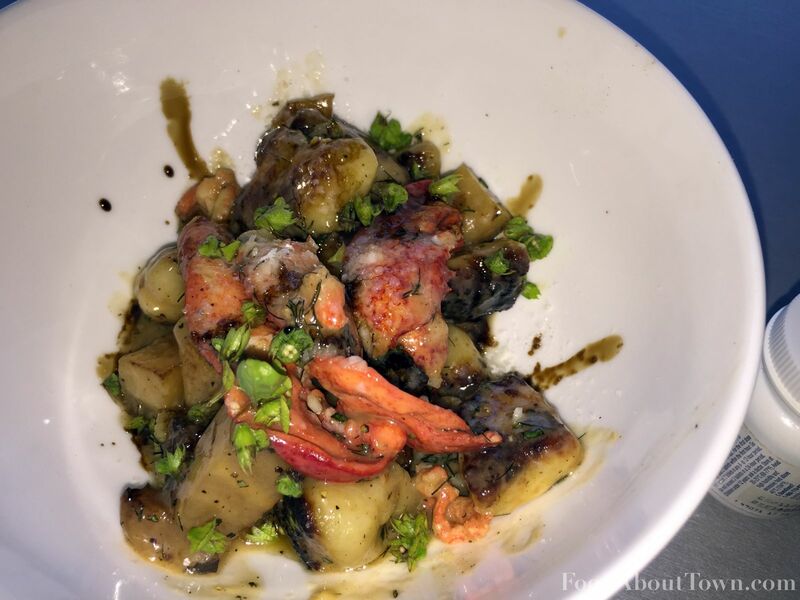 Lobster and roasted golden beets combined beautifully with the seared tender gnocchi and the rich browned fennel butter sauce. Not the kind of combination I would have thought of but the sweet/salty combo from the lobster and beets was an eye opener. Thin slices of cured guanciale are the focus of the bucatini/spaghetti pasta dish. This is some serious crunchy cured pork that is powerfully salty and meaty in the best possible way. A generous portion comes out as a topping on the al dente pasta with a white wine, basil butter, chile, and garlic sauce that re-emphasizes the saltiness and brings some tang to the table. For someone that loves salt like I do, this is a dream come true. 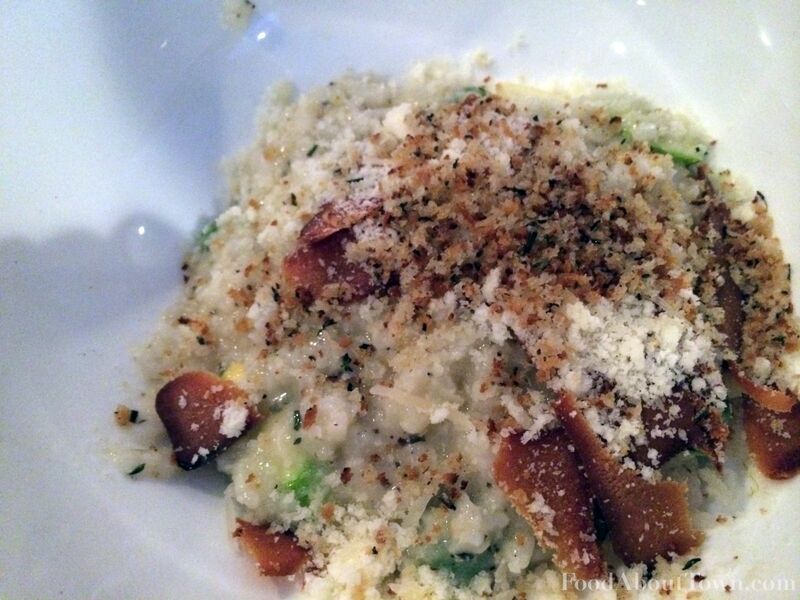 On the current menu the richness is amplified with a soft egg and an accent of Parmesan. 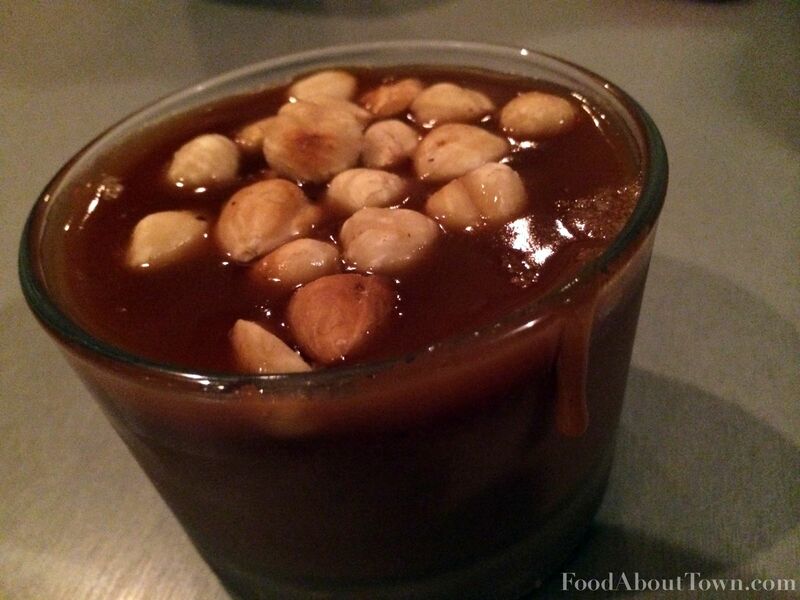 The dessert I’d like to focus on here is the chocolate budino with salted caramel and hazelnuts. A cold rich, semi-dark chocolate pudding is topped with the warm caramel studded with flakes of sea salt and whole toasted hazelnuts bring the crunch. With just the right amount of sweetness and not afraid to bring the salt, this is a dessert I can stand behind. Another solid option is the citrus olive oil cake served with a bright blueberry compote and chiffonade of basil. Service at Aunt Rosie’s is consistently warm, welcoming and knowledgeable about the regularly changing menu. Although the clientele tends to be a bit more on the formal side, the restaurant is quite comfortable and small enough that you will often see Chef Vroman going table to table to make sure everyone enjoyed their meals. It is plainly obvious that I’m a fan of what is going on at Aunt Rosie’s and I truly hope that when you go there you’ll share the same enthusiasm that I do.